Yes, I’m a nerd, but *you* love spreadsheets more than me so no comments…. 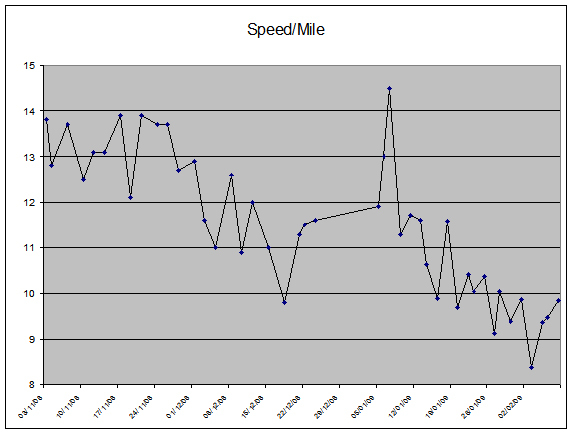 I’ve been plotting my speeds per mile since I took up my training and logic and brilliance has proved what I knew all along. Yep, I’m going to break the world record. See, the evidence is all in the above graph. As you can see my speed per mile is steadily decreasing (ignore the coldest day of the year when I ran up a massive hill). I’ve been plotting the trend for this speed improvement and on the 3rd of October I’ll be able to run a mile in ZERO SECONDS! So surely by the marathon date I’ll finish before I’ve even started? Actually that might well be true as I’ll prob break my leg on the way there. Hopefully. By the way, I ran for 49mins today (5miles) and it was actually just fine. Yep, you read that right. The reason? Well, I fantasised about my marathon run… it involved being knocked over by a madman, then a TV reporter, being unable to see because of blood in my eyes from the falls, then asking for Alessandra to run in front of me, but ended up being escorted covered in blood by Paula Radcliffe. wtf? Is that the internal state of my mind about running a marathon? Who cares though, I could be pecked to death by pigeons the entire way provided it made the run go quicker. Oh no! I don’t know what happened but you aren’t alone – someitmes even with the best training we have a bad race day. If you look back to January on my blog, you’ll see my lousy experience at RNR AZ marathon, which I was SO trained and SO ready for. All you can really do is look forward to the next thing. Feel better soon.